Valentine’s Day shopping is just around the corner! Shop for your sweetheart at the Ice House Mall’s stores and services. Shop and Dining Gift Certificates always make the perfect gift! 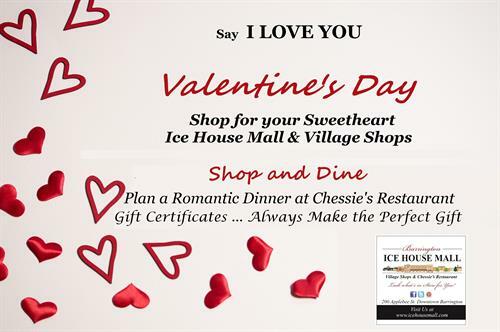 Stop by to pick up a dining certificate from Chessie’s Restaurant, a service gift certificate from Sanctuary Salon and Spa and shopping certificates good for many of the shops at the Ice House Mall. When shopping for that special gift enjoy in store Valentine’s Day specials and free gift wrapping.